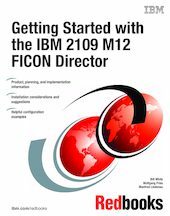 This IBM Redbooks publication discusses how to install, tailor, and configure the IBM 2109 M12 FICON Director, in conjunction with the FICON topologies supported by IBM eServer zSeries (800, 900, and 990) and 9672 Generation 5 and Generation 6 servers. We focus on the hardware installation, as well as the software definitions needed to provide connectivity for the supported FICON environments. This book provides planning information and FICON Director setup information. We also include helpful utilities for monitoring and managing the IBM 2109 M12 FICON Director. This document is intended for system engineers, SAN administrators, and system programmers who will plan and install IBM 2109 M12 FICON Directors. A good background in systems planning, hardware and cabling infrastructure planning, and zSeries I/O definitions (HCD or IOCP), as well as Fibre Channel or FICON Directors, is assumed.